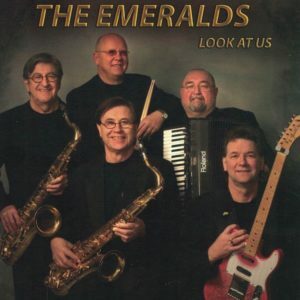 The Emeralds Show and Dance Band originated in Edmonton, Alberta, Canada. The group has entertained internationally in New Zealand, Australia, Singapore, Hong Kong, London, Trinidad, the United States, and Canada. The Emeralds have recorded 29 albums, including their latest release “Look At Us“, resulting in 6 gold, 2 platinum, and 1 double platinum award. In 1997, The Emeralds were inducted into the City of Edmonton’s Cultural Hall of Fame. The Emeralds are Internationally Acclaimed Gold & Platinum Recipients and are the band behind the International Hit “The Bird Dance“. The Bird Dance is featured in the Paramount Pictures motion picture Jimmy Neutron: Boy Genius.